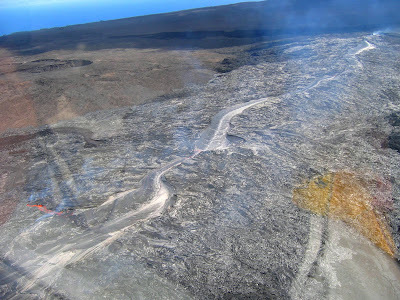 We went around Pu'u O'o vent about 50 minutes, $210 per person by this Helicopter. It was worth to pay. 1983, Pu'u O'o vent begun eruption with blowing up massive white heat magma. 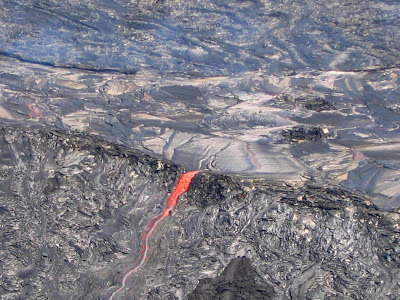 Later joined activity of Kupainaha vent near Pu'u O'o Kilauea is one of the most activity volcano in the world. But it's action dose not explosive we can approach near by. Lava flow to the sea. The vast field were buried with lava, and making new land in the sea. Bank and top of the flow are cooled by air and become solid, but inside the flow it keeps heat and fluidity so it can flows lave to long distance. Finally liquid lave will drain out and be left long tunnel, called Lave Tube. There are many Lava tubes around there. The Royal Garden Subdivision, Estate which had fine ocean view, was devastated in 1990. Many houses remains harmless but cannot live because the all access roads are buried. The Insurance company dose not pay money because of no damage on construction. Residents cannot remove furniture so houses become a kind of Time Capsule.